"How do you handle runners, especially those training for marathons or that run long distances regularly? What about those people who are already active? Wouldn’t they just automatically win the competitions? We always highly recommend that if there are prizes of some kind, several metrics are awarded. We just recently had a large team competition complete -- the teams were large, between 50 and 200 people. In that competition to determine the winners they used the number of people active at the end of the competition as compared to the starting number, in other words the attrition rate. For example: If they had 50 people to start and only 34 finished, they used that percentage of remainders as a multiplier by their average, so that the teams with the largest drop-offs had lower scores. This is a great way to encourage a team leader and members to take an active role in keeping the team together. Goal Challenges (all map-based competitions are goal competitions, as well as the ones specifically listed as 'Goal Challenges' on the Create a Competition page) are great ways to reward everyone who completes a course. In Goal Challenges, everyone who meets the competitions criteria in the requisite amount of time wins. Another way to do competitions is to use a 'limit' - this allows you to only let people within certain average ranges to join a competition. That way you can run one competition for your top walkers, and another one for your lower-lever walkers. (see picture). If users stay with your program, they will begin to improve. Your primary objective should be to reward participation, diligence and improvement. We created the points system in order to measure progress and participation in the site while staying away from rewarding people for walking the most steps. 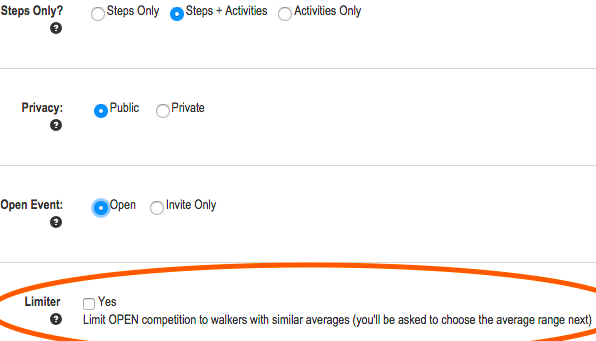 You receive points for everything but your step totals: Competition participation, diligence, logging wellness metrics, encouraging others, etc. In your administration section under 'Statistics', you can get a view of how people are doing, both in terms of the levels they've achieved and the points they've earned. Running a program on total points earned is a great way to measure general progress, without exclusively awarding your triathletes.